Do you have a can of pumpkin in your pantry that you thought would just languish away until Thanksgiving? With all of the health benefits and flexibility of pumpkin, it’s time to get that can off the shelf, blow the dust off, and get busy in the kitchen. 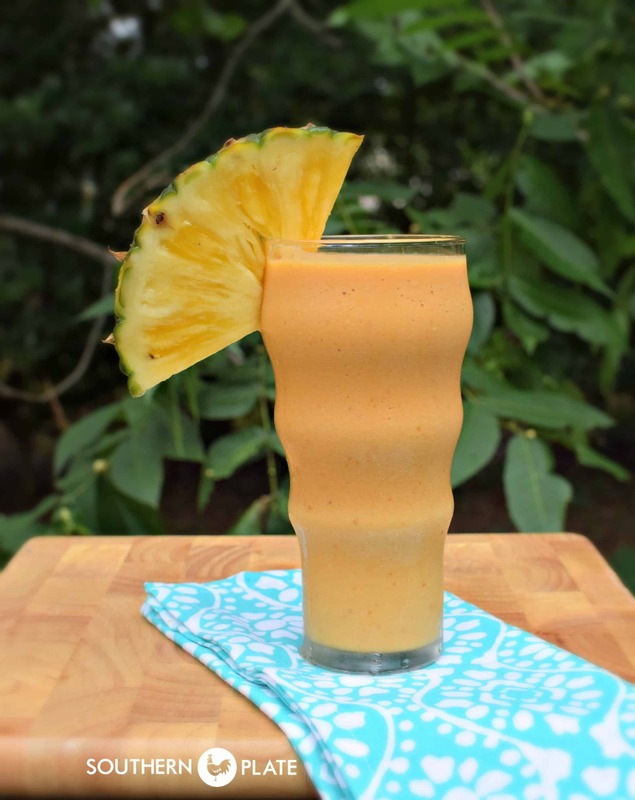 You can start by making this Good For You Pineapple Pumpkin Smoothie! You may be thinking “Pumpkin? But it’s summertime!”. Believe me, I get that. 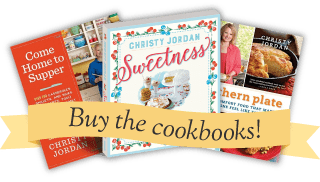 We have become so entrenched into thinking of pumpkin as a fall and winter ingredient that we often overlook the wonderful ways we can use this ingredient all year long. But did you know that pumpkin is actually considered a “superfood”? In fact, it is the most flexible of all super foods. You can substitute pumpkin for oil in cakes and brownies. 1/4 cup of pumpkin will take the place of an egg in a recipe. When you’re baking you can replace 1/2 of the butter in your favorite recipes with canned pumpkin as well. Canned pumpkin is a great source of fiber, Vitamin A, Beta Carotene, and a whole slew of other benefits. Another great benefit is that it blends really well with other flavors, especially summertime fruits, and is good source of potassium, which my son tries to load up on following a run. I’m about to share one of my son’s favorite smoothie recipes with you but I also want to let you know that you can go to pumpkincan.com to see lots more recipes and get more information about how and why to add pumpkin to your diet year round – not just at Thanksgiving. 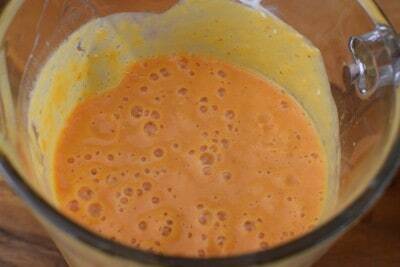 Now this smoothie doesn’t taste like a pumpkin smoothie as you’d think it would. The pineapple and juice along with a bit of lemon blend seamlessly with the pumpkin to produce a tropical flavor that even my picky husband loves (more about that later in the post). 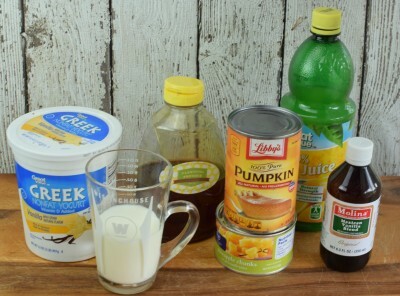 You’ll need: Libby’s Canned Pumpkin*, Nonfat Greek Yogurt (vanilla or plain), Honey (local, if possible), Pineapple chunks in juice, Lemon Juice, Milk, and Vanilla. The Pineapple chunks and juice along with the lemon juice really bring the summer to this smoothie! *Pumpkin is usually found on the baking aisle in most grocery stores. Dump all of the ingredients in the blender (actual amounts are at the bottom of this post). 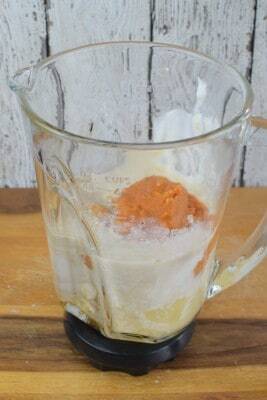 Add 1 cup of ice and blend on high until smooth and creamy. Now, being the crafty gal that I am and knowing full well that my husband professes to not like pumpkin, I took advantage of this orange coloring and told him this was a cantaloupe smoothie. After he drank his second one, I fessed up. His response was “Wow! I was NOT expecting that to be pumpkin!”. I sweetened his just a little bit more than mine and I think the extra sweetness mimicked a melon enough to fool him :). Pour up into two glasses and enjoy your creamy, healthy, summer smoothie! Combine all ingredients into a large blender. Blend on high until smooth and creamy. Serve immediately. Enjoy! *I use 1/4 of a cup of honey but when my son makes these he uses 1/2 and both he and my husband prefer them with the extra honey in them. If you would rather have a sweeter, more dessert like smoothie, go for the 1/2. Disclosure: I’m a member of the Libby’s Pumpkin Blogger team and as such I’m helping to spread the word about the #PumpkinCan Campaign! As a team member, I receive product and incentives in exchange for participating in brand related activities and helping to spread the word. Stay tuned because I’m going to show you some thing to do with Pumpkin that will have you stocking your shelves! Wonderful! My daughter-in-law’s parents are coming over for the first time and this will be a treat for all! Thank you. I hope you have a great visit and enjoy the smoothies!!! Can’t wait to try this. Always looking for smoothies that doesn’t have bananas. Can’t have the banana. This sounds perfect. I hope you like it Fay, it is one of my favorites! Sounds reall good! Will be trying this one soon! I hope you enjoy it Loretta!!! i,ve made these and added a lil nutmeg it was good. also try all spice. This looks so good. I never would have thought of adding pumpkin to my smoothies. I love pineapple, so this one is definitely something I will be trying. I just need to go buy some canned pumpkin now. Thanks for the great idea, Christy! I hope you get the chance to try it soon Samantha!!! Thank you for sharing the coupon!!! Oh boy, I should stop posting when I’m doing other things like talking and watching TV. I meant you can print the COUPON, not recipe. I’ve never seen the combination of pineapple and pumpkin before! It sounds like other people have though, so maybe I live under a rock? Oh my goodness, you have to try it Becky!!! I think you are going to love it!! I would never have thought of using pumpkin in a smoothie. I can’t have bananas so I’m looking forward to trying this. I also like Judi’s suggestion adding nutmeg or allspice. Thanks Christy and Judi. I hope you enjoy it Bev!!! Eek! We don’t want that! I think peaches, packed in a light syrup would be good. But I would add an extra tablespoon of lemon juice. The tang really gives this a citrusy summer flavor. I try your smoothie OMG it was so yummmmy thanks Christy. I am so glad you liked it Agnes!!!! My favorite vanilla is the Molina’s you have in your picture! I used to get it at Dollar Tree, but now I can’t find it. Where do you get it? I get it on the mexican foods section at Walmart. Hopefully you can find it at yours as well!! So very good!!! My honey had crystallized, so I used agave!! I am so glad to hear that you liked it Carol!! Just in time for fall! Love pumpkin and your creativity! Can I use frozen pineapple? I suppose technically you could but you won’t have the pineapple juice like you would from the can so it is going to change the taste and texture I imagine. I haven’t ever made this particular recipe using frozen so you will just have to play around with it a little.